Bristol, ENGLAND. The bus driver who, in a moment of road rage, swerved his bus to knock a cyclist off the road will spend the next 17 months in prison for his actions, a court in England has ruled. Gavin Hill, 29, of Frome in Somerset, England, described his actions as a “moment of madness” while pleading guilty to dangerous driving and causing grievous bodily harm in court on Thursday. 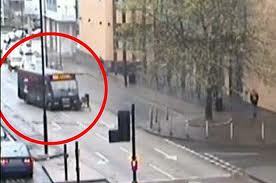 A bus driver for 10 years, Hill was driving a Bugler Coaches bus the morning of April 5, 2011, when he drove too close to cyclist Phillip Mead as the two approached the St. James Barton roundabout in Bristol. At the next traffic light, Mead, 43, pulled up next to Hill’s bus and the two engaged in a heated argument before going their separate ways, according to arguments presented in court. Cameras monitoring the intersection captured the next moments when Hill accelerated his bus to try to overtake Mead and then sharply swerved to the left to knock Mead off his bike. Mead, a father-of-two who was cycling to work that morning, was knocked off his bike and suffered a broken leg, fractured wrist and thumb, according to the BBC. Mead spent two weeks in the hospital undergoing surgeries to repair his injuries and spent months in rehabilitation but says his injuries could have been worse. Despite everything, Mead also expressed sympathy toward Hill. In addition to his prison sentence, Hill was fired from his job with Bugler Coaches and disqualified from driving for two-and-a-half years. He could be freed from jail much earlier than 17 months, however, after Judge Horton ruled that he could be considered for release after serving only half of his sentence.